I’ve been mesmerized by this quote since it appeared on my Facebook page a few days ago. The exact quote is, “You are the average of the five people you spend the most time with,” and it was written by the late motivational speaker Jim Rohn. Does this mean the five people you’ve spent the most time with throughout your entire life? 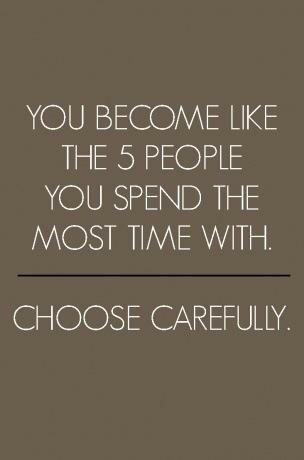 Does this mean the five people you are currently spending the most time with? I am not sure, but I would guess the latter. The five people I’ve spent the most time with throughout my entire life are my parents, my sister Michele, my partner/wife (depending on which U.S. state we’re in), and whatever term you prefer for that which is holy. Alright, so the last one may not technically be a person, but the Holy is often embodied for me, so I’m taking creative liberty. I really struggled to think of the five people I currently spend the most time with aside from my partner and the Holy. I suppose two of them would be the people who are in the office as often as I am. Who is my fifth? If anyone, I suppose it would be my partner’s son, but I only see him a couple of hours a month. Whoa; I don’t think I have a fifth! I am not convinced, however, that this is a bad thing. I don’t think there is any magic to having five as opposed to four or three or six. Only having one or having 10 would be problematic. My online world has removed me from the goodness, and the challenges, of in-person, tangible relationships. Online time is not very challenging. If I don’t like what’s being said (or what I think is being said), I can just log off. In-person communication is much messier. I’ve become much more of a “huggy” person than I ever thought I’d be, and I’m certainly not getting that online or from people at work. Huggy-type feelings from the Holy don’t quite match the endorphin rush of a full frontal hug (FFH) from a close friend. And the Holy rarely laughs at my jokes! I read an author who called “bunk” on this idea that we become like the five people we spend the most time with. His examples were Nelson Mandela and Mother Theresa. His question was, “Does a person whose five people include an abusive partner become like that partner?” I think this author totally missed Rohn’s point. Don’t take this quote literally. I would say we do not become the average of the five people, but the five people cannot but help shape who we are and how we behave. This does not mean we become like those people; we still have free will. We may become the opposite. During times in my life when my five people included at least three Debbie Downers or Freddie Freeloaders, I was not a very pleasant person, especially on the inside. When my life balance shifted to only two of these types, I was a more positive, confident, and happy person. Now that I’ve all but eliminated those types; WOW! Who are the people you spend the most time with; who is in YOUR posse? Do they help build you up or help tear you down? Do they add value to your vision of the beloved community or do they diminish it? Do they kick you in the rear when you need it and offer a soft place to land when you need that?